SHARK POPULATIONS across the globe have been in decline for decades, with approximately 100 million sharks removed from the oceans each year. Demand for shark fin soup drives such relentless fishing, accounting for 73% of sharks harvested from the seas, and as a result 1 in 4 shark species are now endangered. Despite such dire projections, there may be some hope for sharks yet, and it comes from the unlikeliest of sources. Yao Ming, the eight-time NBA all-star who played for the Houston Rockets from 2002 to 2011, is a conservation all-star in his own right. Through a partnership with the conservation organization WildAid, Ming has become the face of the movement to end the consumption of shark fins in China. Sharks are often tossed overboard after being finned and left to die. Photo credit: IFWA. 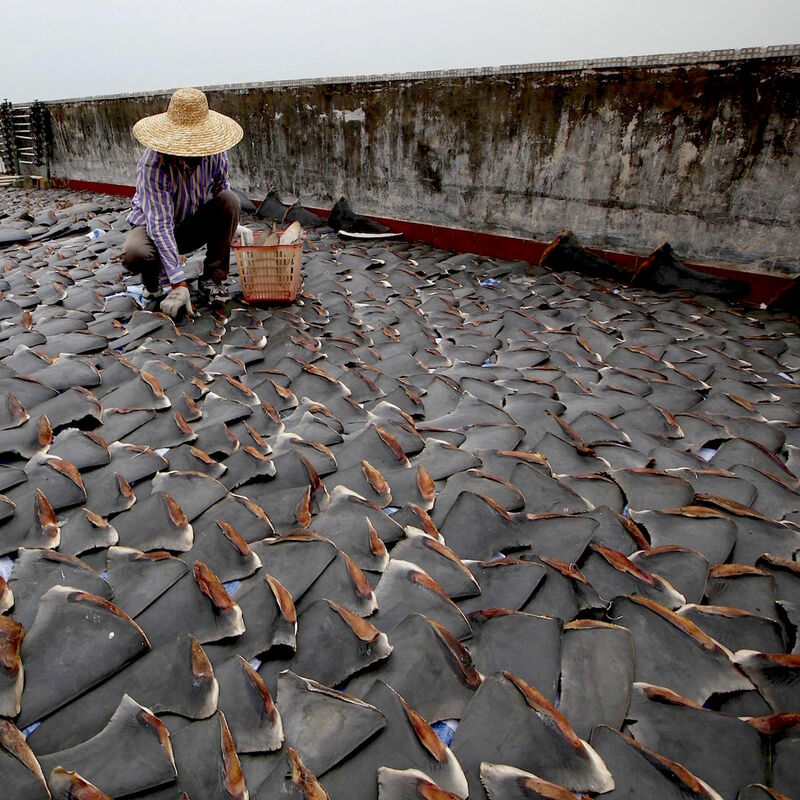 Shark fin soup has been a popular delicacy among the Chinese elite for generations. While shark fins contain little meat, sharks are often sought purely for their expensive fins to fuel demand for soup. 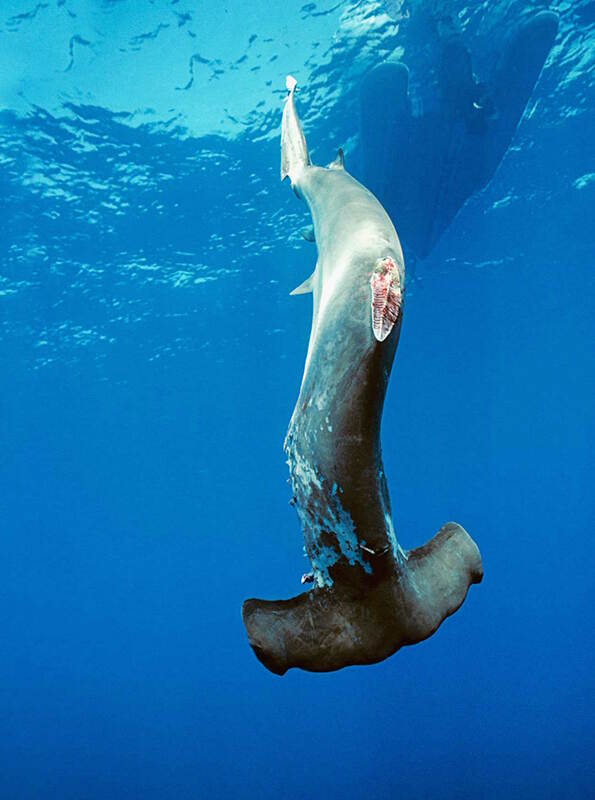 Dismembered sharks are often tossed overboard to drown or bleed to death after their fins have been hacked off, decimating populations of sharks and the ecosystems they occupy. Blowing the popularity of shark fin soup out of the water quickly became Ming’s top priority. In the past decade, increasing affluence and standard of living across China have meant substantially more people can afford the status symbol of shark fin soup. With demand increasing, the WildAid/Yao Ming shark fin awareness campaign was launched to educate the public about the ecological and health problems associated with consuming shark meat. The campaign was launched ahead of the 2008 Beijing Olympics and gathered steam from there. Armed with the slogan “when the buying stops, the killing can too”, ads featuring Ming appeared on Chinese state television 3250 times in 2013, with further exposure through social media and ads on public transit and in public buildings across China. Other media stars, including Jackie Chan and popular Chinese actress Hai Qing, have taken up the cause as well. 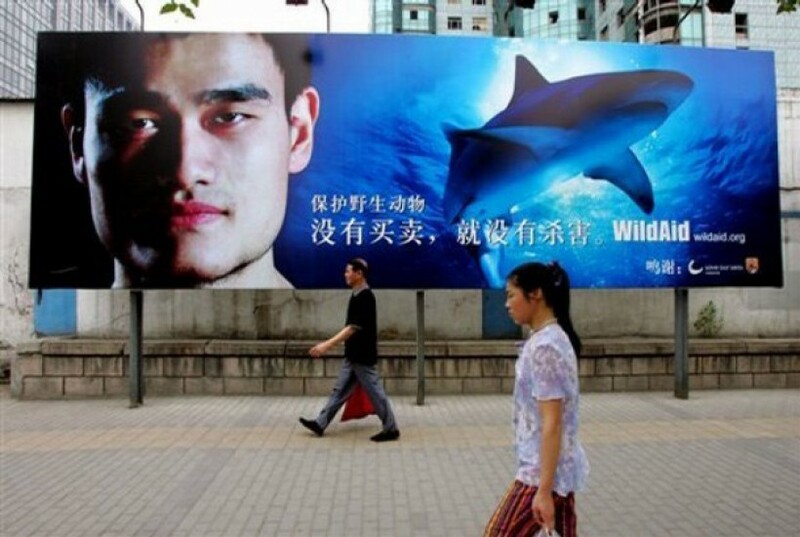 Yao Ming is the face of WildAid’s campaign to stop shark finning. Photo credit: WildAid. In 2006 as many as 75% of Chinese citizens were unaware that shark fin soup, directly translated as “fish-wing soup” even came from sharks. By 2013, public perception of shark fin soup had drastically changed. 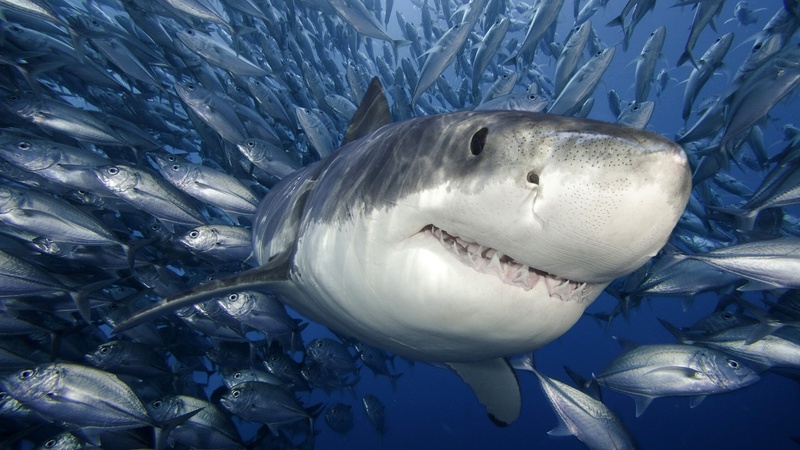 An independent iResearch survey in 2013 found that 82% of respondents said they would stop their consumption of shark fin soup, a direct result of Ming’s awareness campaigns. The same survey found 91% support for a nationwide shark fin ban, and the Chinese government has since banned shark fin soup at state dinners. In addition to the awareness campaign, those surveyed cited a desire to conserve sharks and animal cruelty concerns as reasons for giving up the soup. Recent figures have shown demand for shark fin soup beginning to fall. 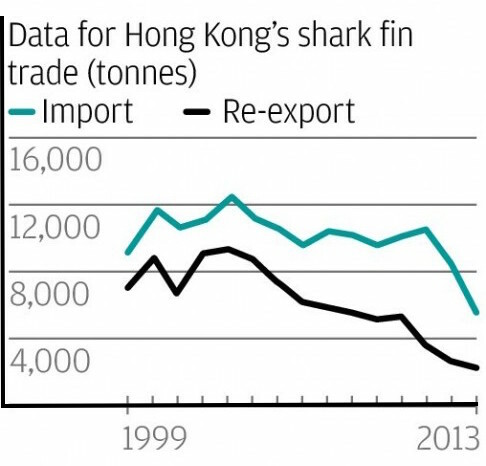 The shark fin trade in Hong Kong has declined in recent years. Source: WWF. Prices for shark fin in Guangzhou, China’s shark fin trading hub, have fallen by 57% from 2012 to 2013 with prices still in a free fall. Hong Kong, another shark fin hot spot, saw the volume of shark fins traded drop from 10.2 million kg to 5.3 million kg from 2011 to 2013. Fishermen in Indonesia, a popular source for Chinese shark fins, have seen their income from shark fishing drop by 80% since 2007, threatening to make the shark fishery go belly up. Building off of success in China, WildAid expanded the reach of Ming’s campaign to Hong Kong, Malaysia, Singapore and Taiwan in 2015. Through his work with WildAid, Ming can take the lion’s share of the credit for such a sea change in public opinion and drop in shark fin consumption. A Chinese superstar and natural icon, people across the People’s Republic adore and trust Ming. His campaign has been far more effective than a faceless international campaign of the same scale could ever be. In a monumental step towards halting the shark fin trade, UPS banned shark fin shipments in 2015. Petitions are underway for FedEx to do likewise. Photo credit: Associated Press. Sharks are by no means saved. A recently leaked video of a whale shark being dismembered for its fins while still alive illustrates the very real threats still facing sharks worldwide. But changing public opinion is the first step to real change. The effectiveness of such a campaign boils down to awareness and trust. Many consumers of shark fin soup, or of ivory or rhino horn for that matter, are unaware of the ecological damage caused by such products, or of the inhumane methods of harvesting them. To the uninformed consumer, shark fin soup is simply a cultural status symbol, a dish that upwardly mobile Chinese aspire to afford. Since condemning shark-finning means condemning a cultural practice, the most effective results and limited backlash can be achieve by a trusted, cultural insider. 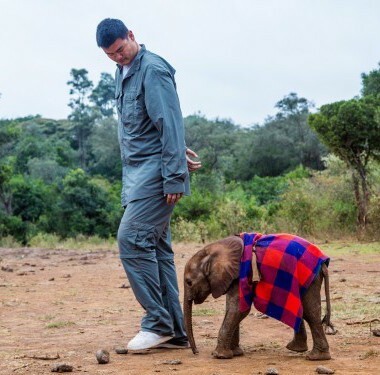 Yao Ming has broadened his focus to reducing consumer demand for ivory and rhino horn. Photo credit: WildAid. Positive results from his anti-shark-finning campaign have encouraged Ming to target other unsustainable branches of the wildlife trade that can be traced back to China. Elephant and rhinoceros poaching in Africa have spiraled out of control in recent years due to demand for ivory and rhino horn back east. Ming has visited Africa several times to bring light to the issue, and his visits with locals, tour of an elephant orphanage, and first hand encounters with poaching are featured in the fantastic Animal Planet special Saving Africa’s Giants. Hopefully shedding light on the issue will begin to spur cultural change and lessen demand for exotic animal products. Sharks are not alone in their plight. Lots of species could benefit from a little awareness. An educated consumer is the most powerful weapon conservationists have when battling market forces that threaten species with extinction. When the public’s attention shifts towards a conservation cause, the money and political willpower to fix it follow close behind. Do your part to stay informed, and be an eco-conscious consumer. Watch documentaries, read articles, and look at labels before purchasing. When you happen upon a cause that you care about, let people know it’s important, both to you and for the Earth. Take to social media to let your friends and family know; by associating yourself with the issue in their minds, they are more likely to change their behavior. After all, that is what Yao Ming did in China, just on a larger scale. You don’t need to be an international sports icon to affect change. Everyone has the power to be a superstar in their own community. Once you speak up, you may be surprised how many people were waiting with open ears. I’m glad Yao Ming is raising awareness and is being supportive. He is doing a lot for wildlife in general, also raising awareness of poaching by condemning the purchases of ivory and rhino horn. Truly a great man! Great news – if only they would also campaign against the torture of poor Moon Bears for their bile!! Yes, China and some other East Asian countries have a number of wildlife issues they need to progress on. Maybe something Yao Ming and WildAid can work on next! Moon Bear bile, yep, and Rhino horn. I love your blog though I wish there wasn’t a reason for it. The cruelty of humans is unbelievable. We can be so stupid, callous and vicious – often mindlessly. Thanks for reading! I agree that humanity has inflicted an incredible amount of hardship on the natural world, but thankfully there are dedicated people out there working to make it right! please raise more awareness for other animals and plants in even more dire straits like the pangolin and helmeted hornbill, both of which are being heavily hunted to extinction, both are critically endangered, there’s so many more species out there that needs our attention and protection! Strange? It’s called shark fin soup but people didn’t know it was made of shark fins? WTF! Take Home Message: Thanks to education and outreach efforts on the part of Yao Ming and WildAid, public perception of shark fin soup in China is changing for the better. While the issue of shark fin soup is largely confined to China, a lack of consumer awareness concerning wildlife issues is a worldwide problem. Fixing this problem starts at the individual level. Be an informed consumer, avoid unsustainable products from industries that rely on endangered species or exploited ecosystems, and tell your friends and family to do the same.